Most people know that drinking tea is extremely beneficial for our health. However, very few people know how to make it also benefit their pocket. The secret lies in the reuse that tea bags have! Keep reading and you'll be surprised by how many uses, used tea bags can have, even though most people treat them like waste. 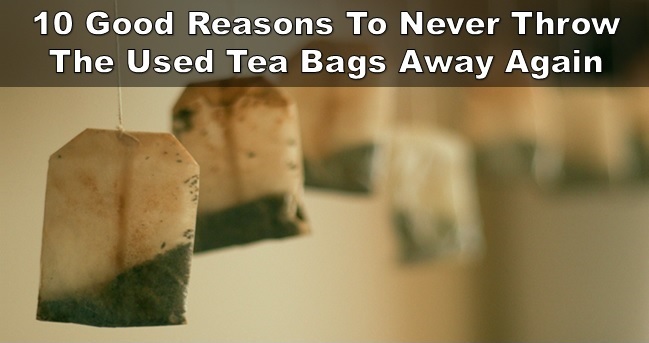 We present below the top 10 alternative uses of tea bags. 1. Sooth puffy and tired eyes - the most common use of tea bags. 9. Tea bags effectively absorb unpleasant odours. Bonus: Peppermint tea bags keep rats and spiders away from your home. You just need one ingredient, and spiders and rats won't enter your home again. Take a peppermint tea bag and make your usual cup of tea with it. Once you have soaked the bag into the tea, pull it out and place it in the corners you expect the rodents to inhabit. Any uncovered hole or opening in the house you suspect the mice would be entering through, place the used tea bag there. You would need more than one tea bag for this process. The smell of peppermint from the tea bag repulses the pests, and in just a couple of days your home will be free of them. Unlike with the use of pesticides, you won't have to clean up any carcass as an aftermath. No bad odor, and pests and insects will stay away from your premise.